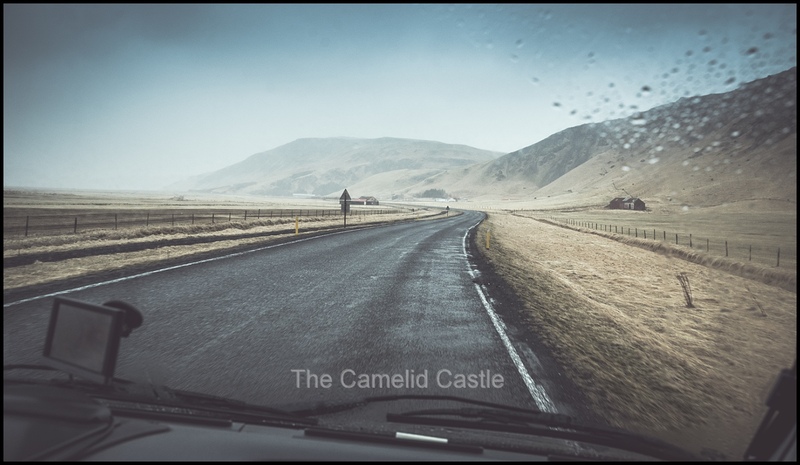 Day 8 of our Iceland motor home adventure was indeed an adventurous one, with crazy winds almost trapping us in the South and throwing our plans into disarray. 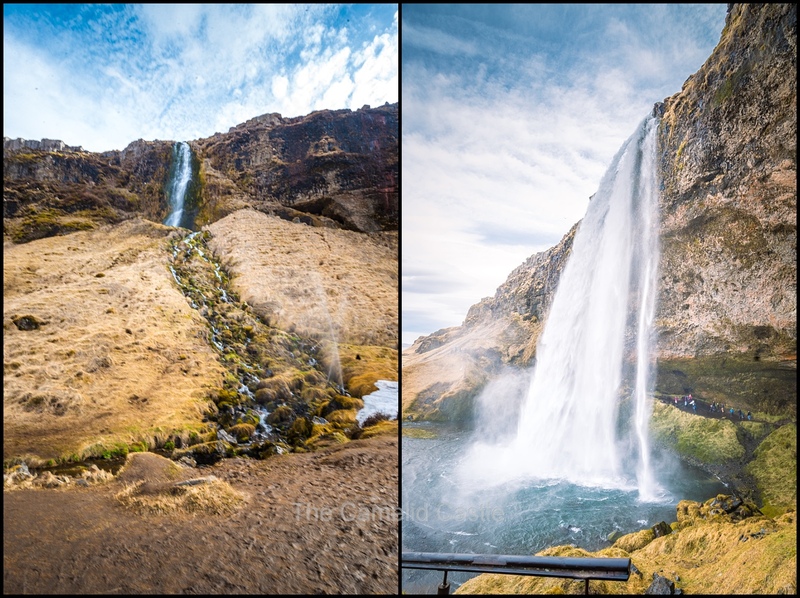 We did manage to escape and make it to a number of Iceland’s spectacular waterfalls before an afternoon soak in the ‘secret lagoon’ natural thermal pool and a visit to a geyser mud pit. Speaking of mud, the day ended with even more adventure as we got the motor home bogged in mud! After a night of not much sleep due to high winds, the day had an adventurous start…….. Anto and I had been up late aurora hunting and it was windy but the forecast wasn’t too bad. We woke up again by 3am feeling like the van was getting blown over and checked the wind and it was constantly gusting at around 18m/s (65km/h). We debated moving the motor home to face a different direction, but figured out we were actually already in the best position, which was somewhat concerning. In the end none of us slept much as the wind got worse and worse and we were rocking all over the place making us feel like we were out on a rough sea. Somehow we all slept until 8am (our best effort yet) as we’d all been restless and awake half the night. By the time we woke up van was feeling like it was about to take off at any second and the wind was howling and there was sleeting rain. When we checked the wind was up to 24m/s (87 km/h). This was concerning as we were told by the owner of the motor home not to drive above 20m/s and we had no insurance cover over 25m/s (90km/h). High winds are very common in Iceland and we’d been carefully watching the wind forecasts as we’d been travelling around and had so far been lucky. 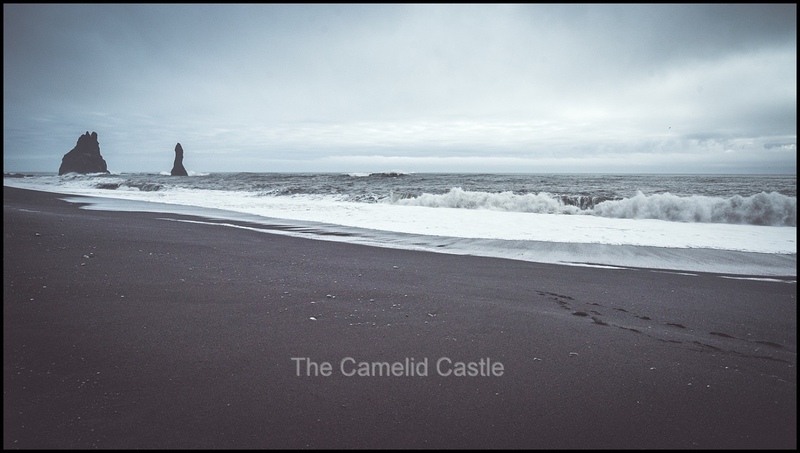 Unfortunately the forecast for today had changed, with high winds getting worse throughout the day in the entire South region of Iceland and staying bad (over 25m/s and up to 40m/s- 145km/h) for a few days. This meant there was a real possibility that we could be stuck and unable to drive the motor home. 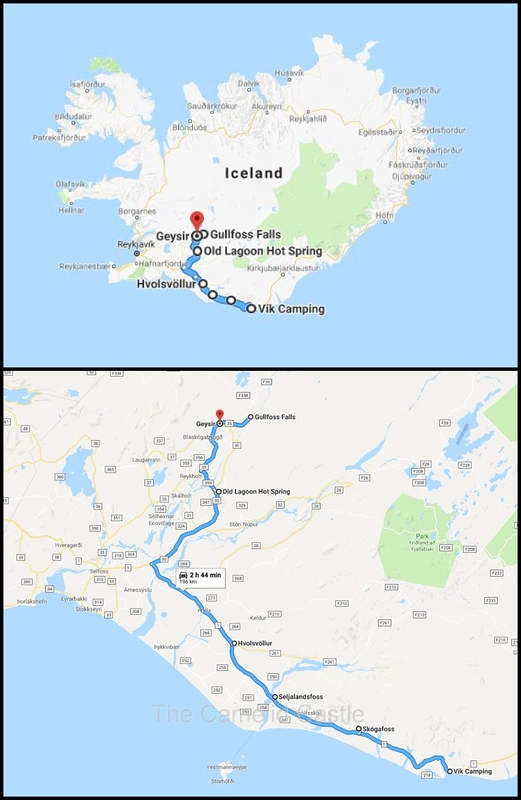 We had a flight out of Reykjavik in 2 days time and we were only about 190km from Reykjavik in straight line distance. So in the worst case scenario if the winds dropped we could make a dash for it to the airport but we had plenty of activities still on our itinerary and no desire to be trapped in a rocking motor home in howling winds for 2 days. Not feeling all that confident about the weather forecast, the plan was to eat breakfast and be ready to make a run for it if we got a break in the wind. 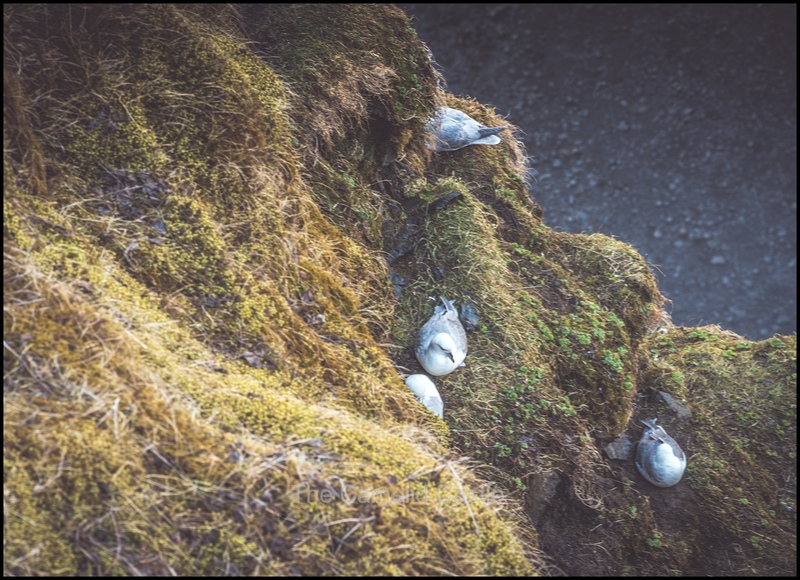 We’d originally planned to visit some of the birds nesting in the cliffs around the campsite and head back down to Vik beach, but the sleeting rain and 90km/h constant wind meant hunkering down eating porridge was a better option. Anto had the Icelandic weather app on his phone and we were watching the wind on all the nearby stations. As soon as it dipped below 20m/s for a few minutes (the ‘safe’ driving level) we strapped the kids into their car seats and high tailed it out of the camp site quick smart. We hadn’t even finished getting out of our PJs, let alone brushed our teeth or done the dishes, so we were tearing over the mountain with things rattling everywhere. We’d seen that the wind station on the other side of the mountain was a slightly lower reading so we were hoping we’d get ahead of the wind if we made it over the mountain pass in one piece! 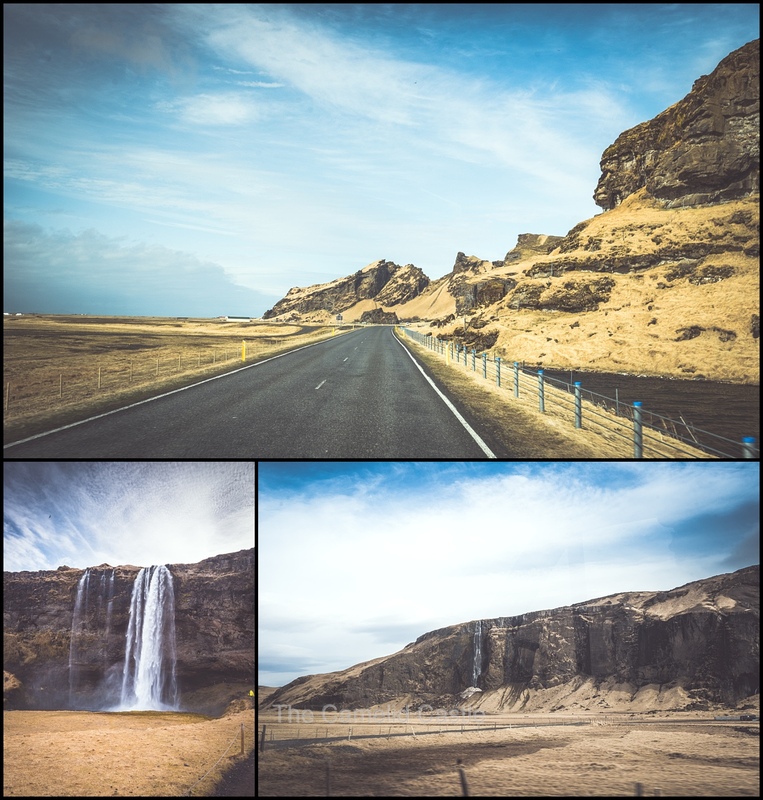 It was an extremely windy and unpleasant drive out of Vik. The winds were howling, blowing us all over the road and it was raining and grey. As we went over the mountain the usual road signs displaying the temperature in the current and nearby locations, were also today displaying wind readings ominously flashing red. These Icelanders take their weather warnings seriously and this was the first time we’d seen red numbers appearing for wind, which was mildly concerning. Our first planned stop for the day was the Dyrholaey Arch and Cliffs, a pretty spectacular photo spot, but sadly on the opposite side of the headland to where we’d just left. The wind station nearest to the cliffs was showing winds close to 25m/s so we figured we may get stuck if we even attempted to get in there. 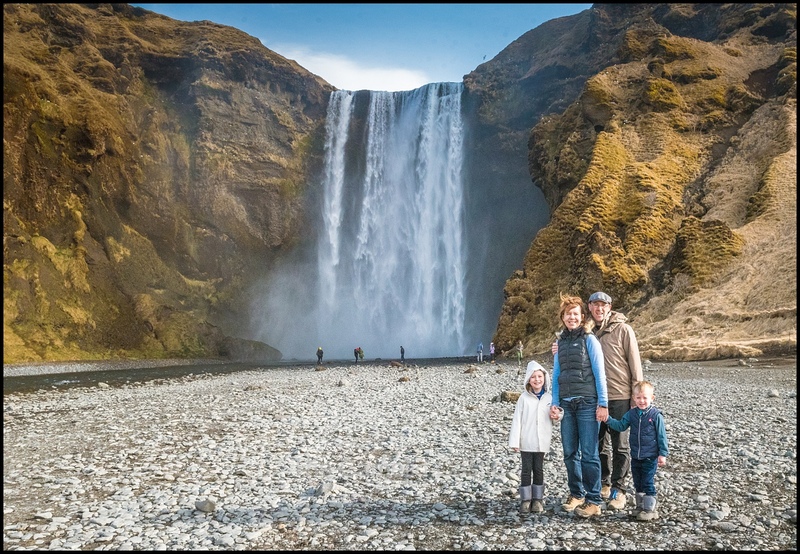 Given the current level of sleet and grey sky it wasn’t going to make for good photos so we decided to reluctantly skip it and head to the next planned stop at the Skógafoss waterfall. 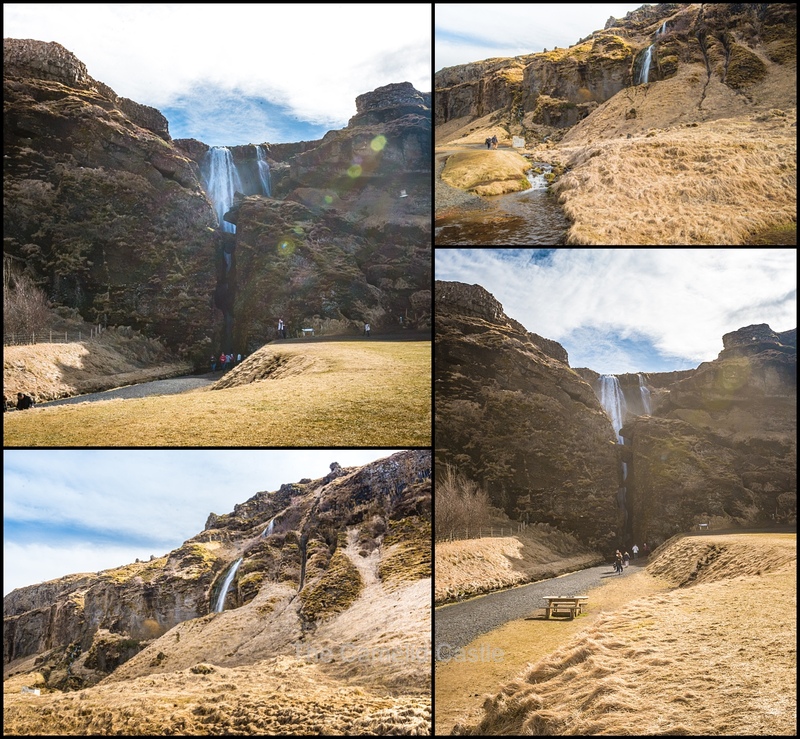 Skógafoss is not a small waterfall and you can can actually see it from the road as you approach. 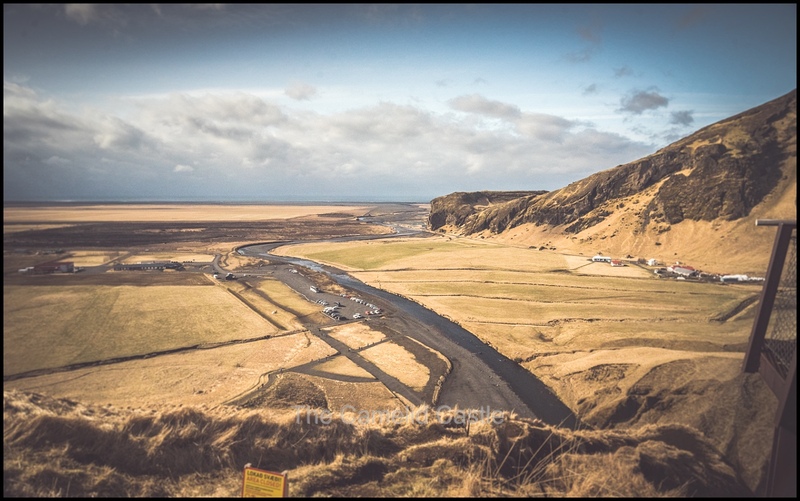 As you can see despite the terrible weather when we escaped Vik, half an hour earlier, not far down the road there was blue sky and sunshine! 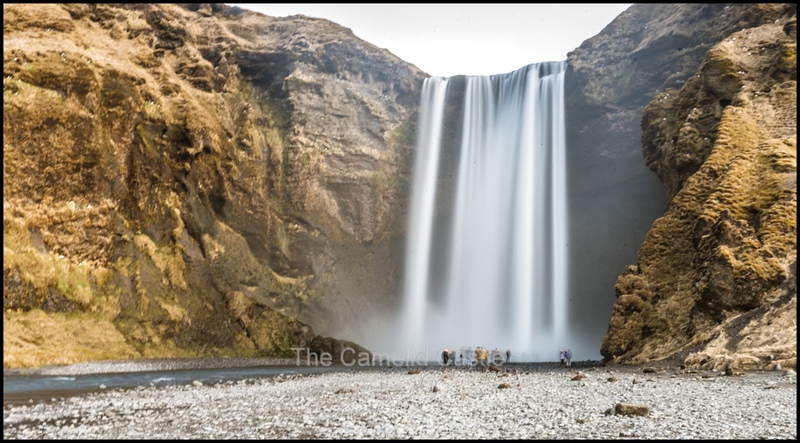 The weather forecast was for the bad weather and high winds to head west (as were we) during the day……..
Skógafoss is one of the biggest waterfalls in Iceland, with a drop of 60 meters and a width of 25 meters, and you can walk right up to it, as long as you don’t mind getting sprayed with water! 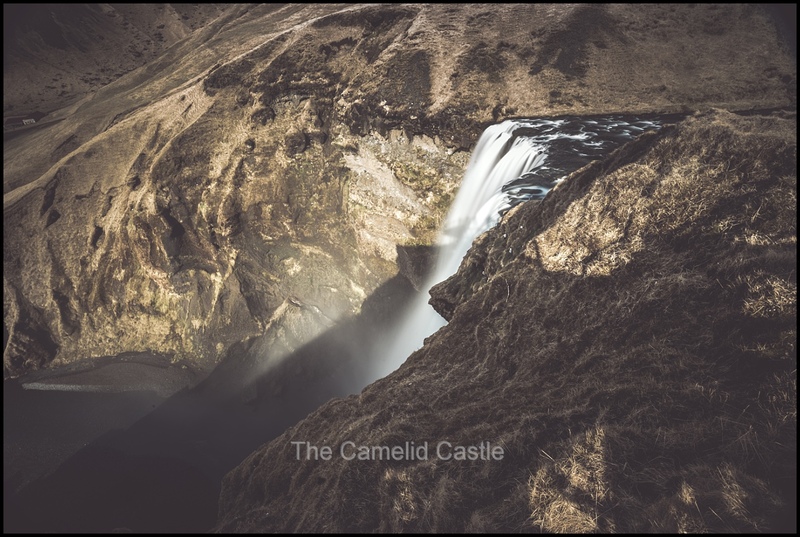 A legend is connected to Skógafoss waterfall – it is believed that behind it you can find a chest filled with gold and treasures. 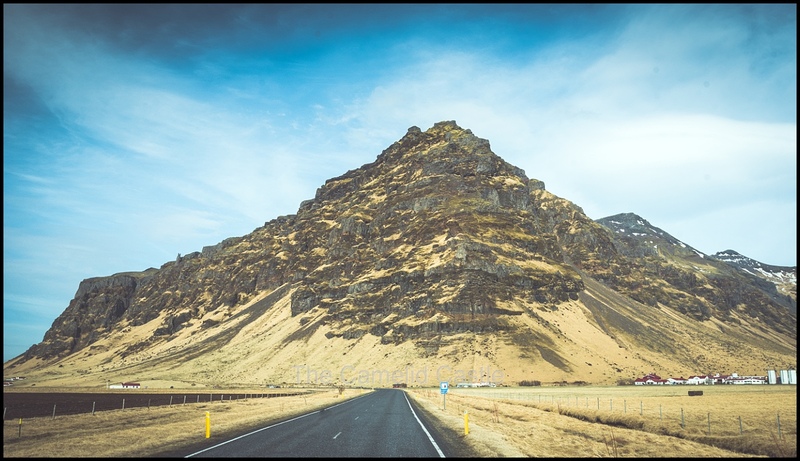 The story goes that Þrasi Þórólfsson, the Viking Settler at Skógar (Eystriskógar) in around 900, hid the chest and it is said that the first man who goes there will find great treasures. We weren’t quite brave enough to go looking behind that mountain of water, but it did make for some spectacular photos! 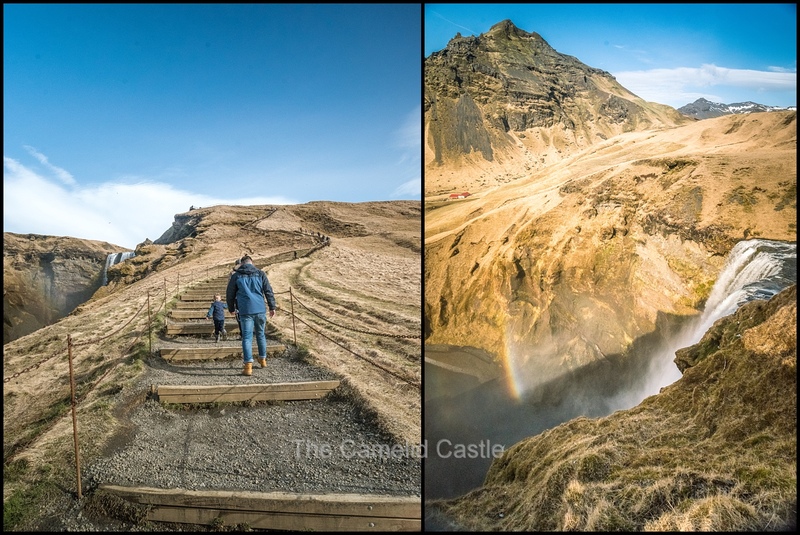 Due to the amount of spray that comes off Skógafoss, it is known for its beautiful rainbows on sunny days. Sure enough we were lucky enough to catch some rainbows at the bottom! We even managed a quick photo of all of us together in front of the waterfall, can you tell it was a tad windy! After admiring the waterfall from the bottom it was time to climb the 527 steps to view the waterfall from the top. A tired Astrid, who is normally keen for some stair climbing, was not in the mood this morning. 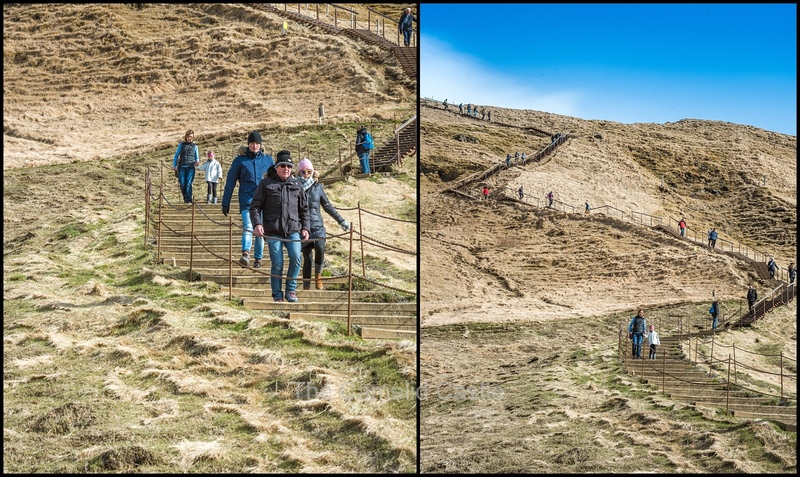 Some of the steps were very large and the high winds made the trails somewhat slow and challenging. You can take several longer hikes down the river that feeds the falls, but the trails were rather muddy and we were attempting to stay ahead of the bad weather, so it was back down all the stairs to the car park. It was rather hard work in the wind with the kids. Soren ended up being carried part way down the huge stairs and Astrid just had a very long whinge most of the way down. It had gotten busy while we were up there and we were going against the majority of the traffic which did not make it easier! It was now after 10.30am and late enough that all the tourist buses had started pouring in from Reykjavik. Again one had parked us in (despite there being plenty of other parks available). This meant a delay while we waited for some other people to return to their cars and me doing some directing while Anto did a 25 point turn in the motor home to get out. We were not impressed! 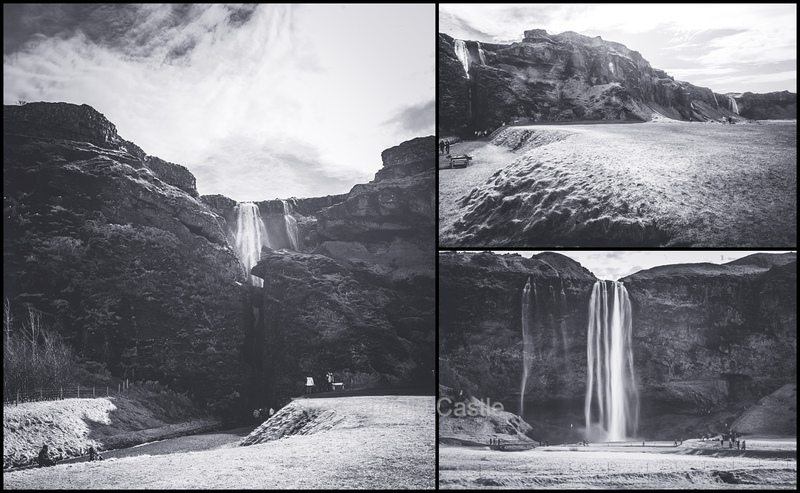 It was a 20 minute drive down the road to our next waterfall of the day, Seljalandsfoss. It was definitely milder temperatures and there was not much snow to be seen here in the South. Again we could see the waterfall as we were approaching from the road. 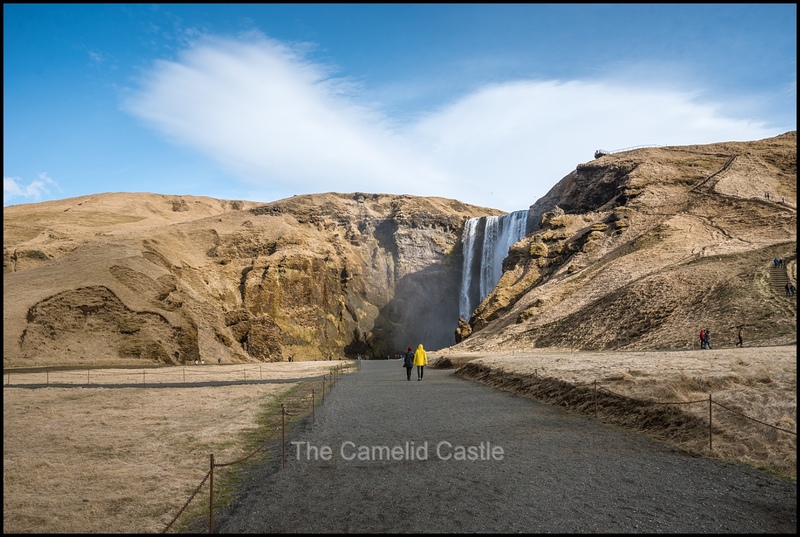 Tourism has exploded in the South of Iceland (it’s quite accessible as day trips from Reykjavik) and we had noticed an increase in paid car parking and food vendors camped out in the car parks. This was another paid car park and now being after 11am it was packed with day tripping tour buses full of tourists in inappropriate outfits (we saw more than 1 mini-skirt with high heels!) trying to cram as many sites as possible into one day. It made us long a little for the quieter parts of the country. 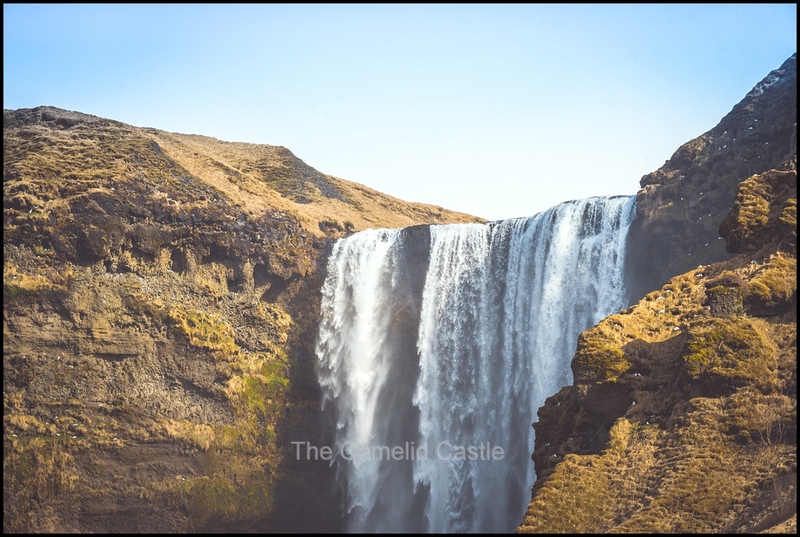 Luckily, a visit to Seljalandsfoss is definitely worthwhile. 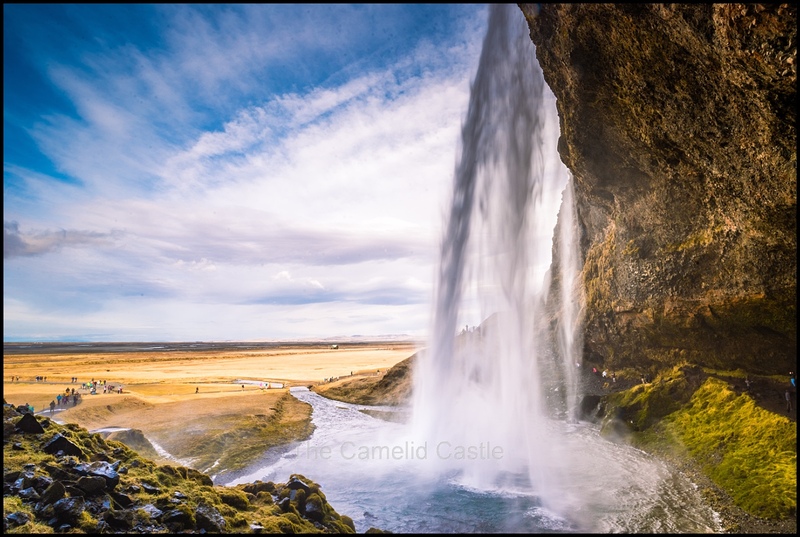 It is 65m tall and you can walk behind the falls to get an entirely different perspective. There is a marked trail up to the falls and behind, but it was slippery and full of mud. We were wearing our hiking and snow boots and were still slipping and sliding about, some tourists were regretting their choices of outfits. The spray coming off the falls was amazing, but you got soaked, lucky we had coats! The path behind the waterfall is closed during Winter (i.e. most of the year) due to snow. Unlike most of the rest of the tourists attractions, we got lucky this time and it was actually open. There was a tiny bit of snow still on the ground but the warmer temperatures in the South had worked in our favour on this occasion. There are a number of smaller waterfalls nearby so we wandered down the trail to check them out. There were plenty of people around taking advantage of the ‘warm’ weather and picnicking along the route but we decided to wander back to our motor home for a quick snack and then try to stay ahead of the weather and drive to a less crowded picnic spot and stop for lunch. The winds were continuing to pick up and we could see the black skies chasing us, so it was off we went. On way I managed to spill a thermos coffee all over myself so we had to stop at the first service station we could find to rinse out my clothes and get changed. 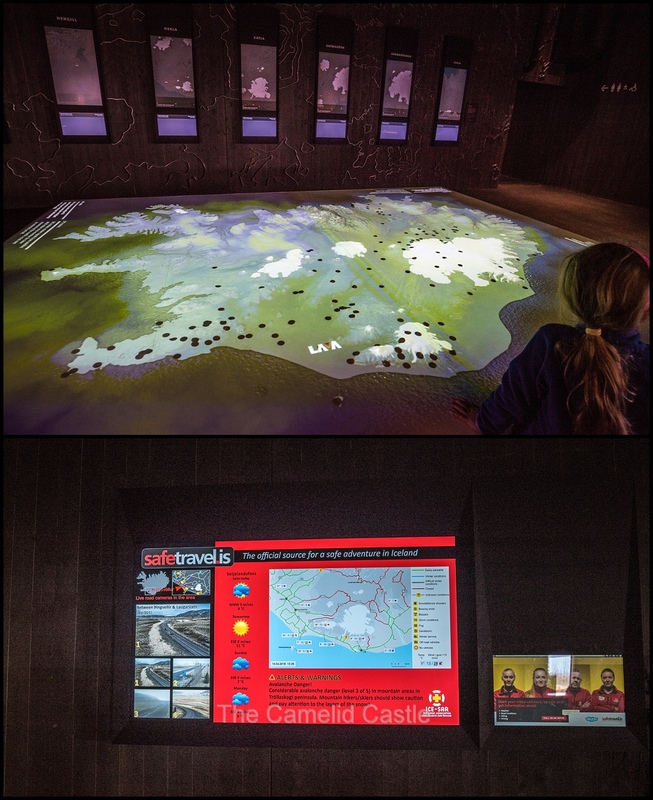 We happened to stop right near LAVA – the ‘Iceland Volcano & Earthquake Center’ in Hvolsvöllur. There was plenty of parking out the back so we stopped and made ourselves some lunch before deciding to go in and have a look. The centre had a good gift shop and cafe (although we’d just eaten so weren’t tempted) and looked like it had lots of great exhibits based on the few free ones in the foyer area. Sadly entry was over $40AUD each so we decided at those prices to give it a miss! They foyer of the Volcano Centre had all the weather, wind and road warnings for the area displayed, and we noticed that the winds in Vik were up to 26m/s and there were road wind warnings now active all the way to Seljalandsfoss so we are glad we made it out of the area and were still ahead of the bad weather. It was time to get back on the road and it was a 45 minute drive to our next stop, the Secret Lagoon! We had kept this stop a surprise from the kids, as we weren’t sure we could get a time slot or if we would make it fit into our itinerary. You can book tickets in advance (which is recommended) but when we looked the night before, the only available time slots were not at times that would fit into our itinerary for the day. Given the drama we’d had with wind that morning we were thankful we hadn’t pre-bought tickets in case we didn’t make it at all! We arrived at the lagoon at around 2.45pm and Anto went in to check whether we could get in. Despite indicating on their website that time slot was unavailable we were able to go in, so we were again glad we’d risked just turning up. We then told the kids where we were and they were rather excited as they had no far loved all of our Icelandic swimming experiences. The Secret Lagoon natural hot springs are located in the small village called Fludir and are in the Golden Circle area. 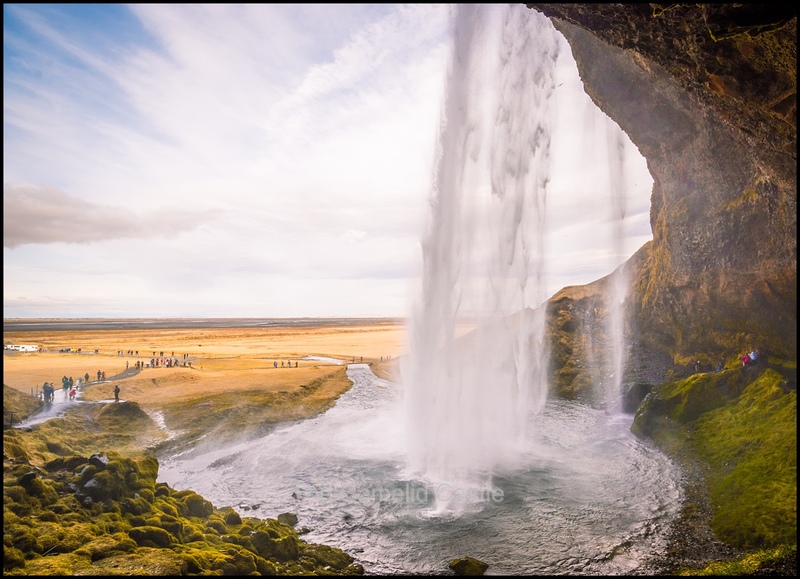 It is the oldest natural spring in Iceland and is headed directly from geothermally heated water. Unlike the other swimming pools we’d visited so far this is a natural rock pool, closer to the ones traditionally used in Iceland for centuries. In we went and while we were all familiar with the changing and showering protocols for swimming in Iceland, the Secret Lagoon is much more tourist focused. Iit is a lot more expensive than the local swimming pools, and was full of tourists, most of which had obviously not swum in Iceland before. Many were being silly about stripping off and showering naked before entering the pool. Astrid was giving several American tourists a right talking to about observing the showering and changing signs and not walking water from the wet area to the dry area. She was particularly unimpressed with people trying to shower with their swimmers on! The Secret Lagoon is a more natural (stone bottomed) pool than the swimming pools we’d visited, but the water was still a pleasant 38-40 degrees Celsius. 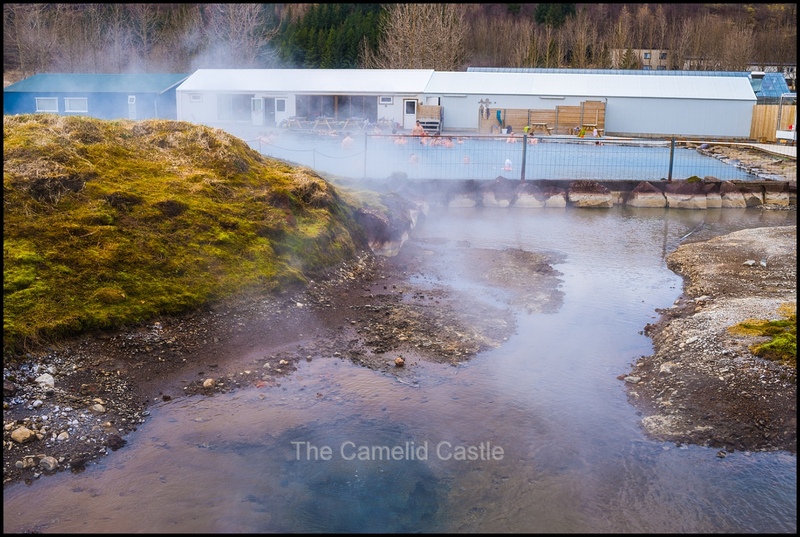 With the cold outside air there was still plenty of steam rising out of the water……. We had a good swim around and the kids (and Anto) enjoyed floating around on the noodles. As the pool was fed directly from geothermal water running into the main pool, some areas were much warmer than others so we had to be a little careful where we swum. The bottom of the pool was rocky and sandy and there was the very distinctive sulphur smell (so we figured we’d all be smelly when we got out). You can buy drinks and snacks at the pool, and plenty of tourists were lazing away the afternoon drinking! You can see from how red our faces are (especially the kids) how warm the water was. I had to keep getting out to cool off! After an hour of relaxing we had to drag ourselves out as we were all getting a little too hot. We had showers and dressed and then took a walk around the boardwalk in the lagoon to check out the (non-swimming) thermal pools and geyser. Some of the pools were sitting at over 100 degrees Celsius and were feeding water into the main pool, so you could see why it was constantly hot in there! While it was certainly a more pricey swimming experience (and way more touristy) we did enjoy another afternoon swim. The most popular tourist swimming spot in Iceland is The Blue Lagoon, closer to the airport. We’d decided not to visit here as it made The Secret Lagoon look exceptionally cheap and we’d read the Secret Lagoon was a more natural experience. 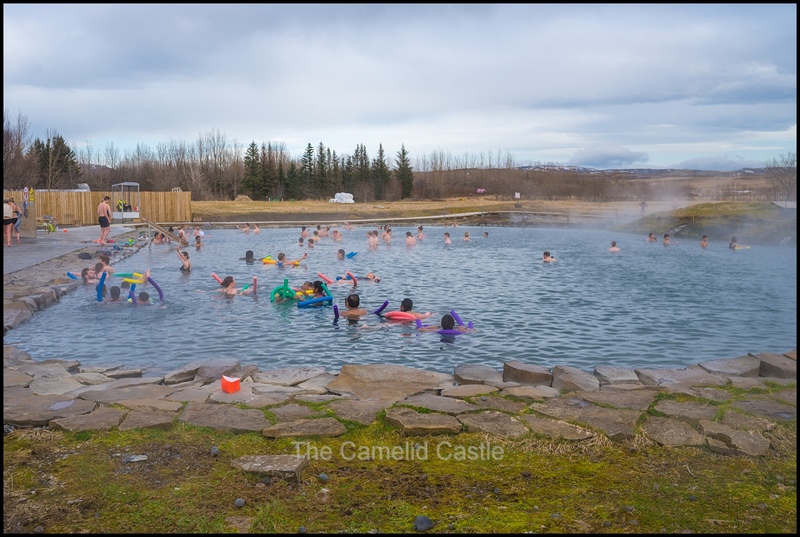 For reasonably priced swimming, the local pools can’t be beaten, but we were glad we’d experienced one of Iceland’s many more natural thermal springs too! 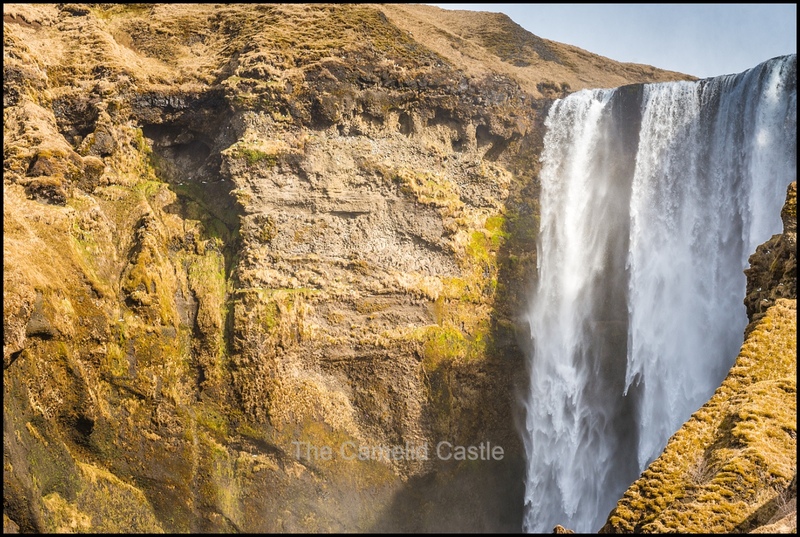 It was after 4pm when we were back in the motor home and our next stop was Gulfoss, yes another waterfall! 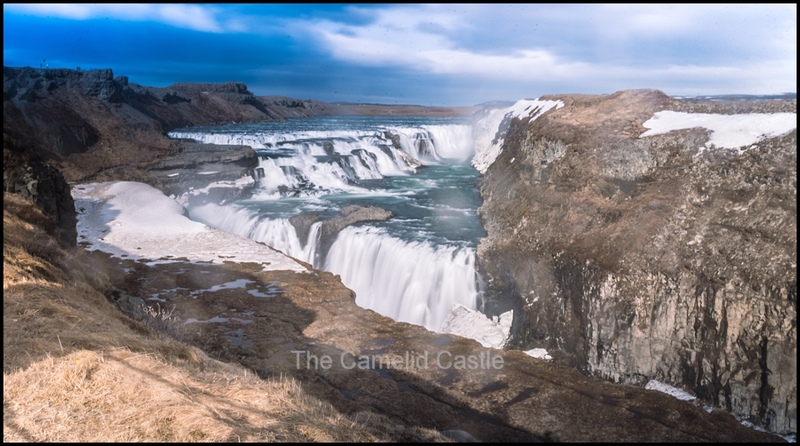 Gullfoss, know as the ‘Golden Waterfall’ is another of the iconic waterfalls of Iceland . Gullfoss is part of the poular Golden Circle tourist route, on the Hvítá (White) river which is fed by Iceland´s second biggest glacier, the Langjökull. The water plummets down 32 meters in two stages into a rugged canyon which walls reach up to 70 meters in height. On a sunny day shimmering rainbow can be seen over the falls. We had been lucky enough to have had mild temperatures all day, but when we got out at Gulfoss it was absolutely freezing with an icy wind. 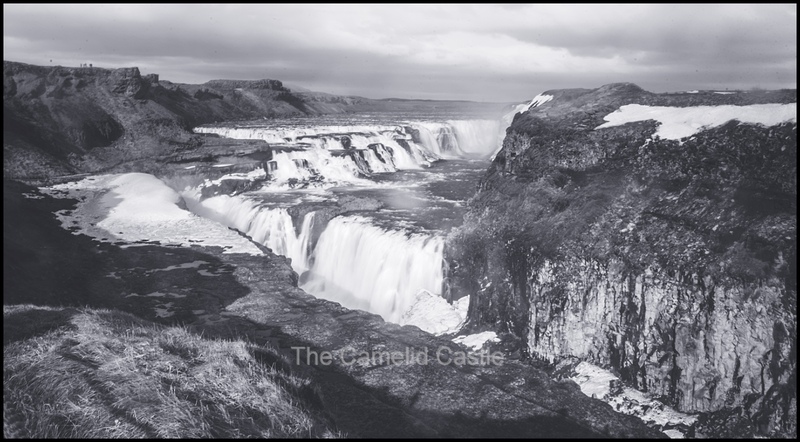 As we’d driven up into the mountains approaching Gulfoss, snow had started appearing again, signalling colder temperatures. With wet hair from The Secret Lagoon and a fierce wind straight into our faces it wasn’t very pleasant on the viewing platform. The kids were not impressed! Luckily the falls, with their multiple drops and huge water volume were rather impressive, but after a few photos we were all pleased to jump back into the motor home to warm up! 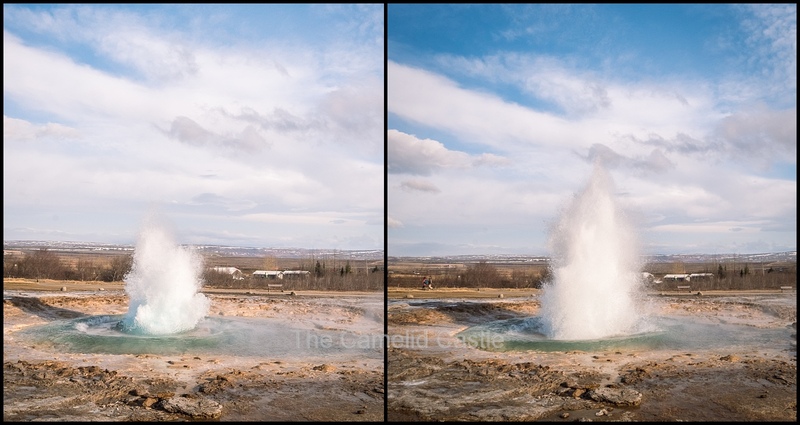 It was then off to our last stop of the day, the geysir geothermal area, around a 10 minute drive away. 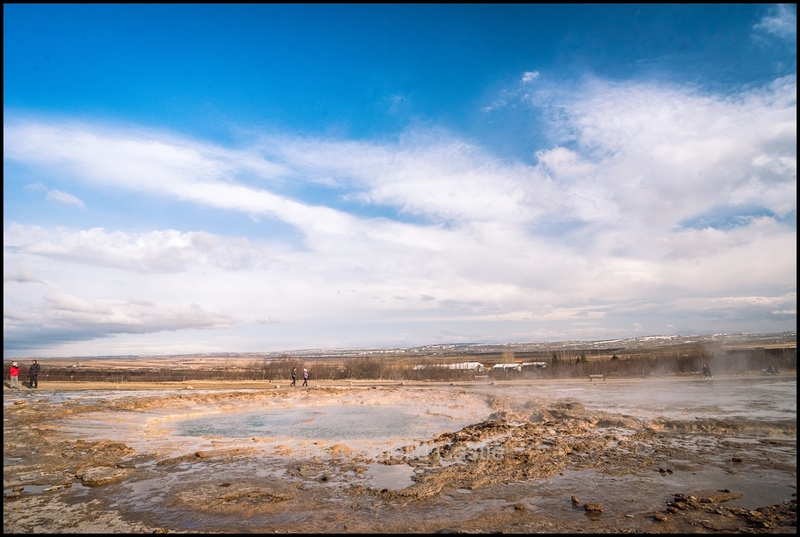 We’d seen plenty of geothermal activity in Iceland. 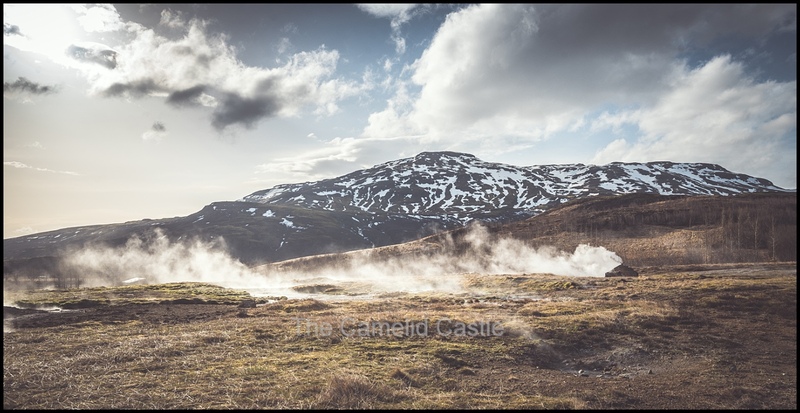 The Icelandic name of the Great Geysir is Stóri Geysir, which literally translates as ‘the great gusher’. 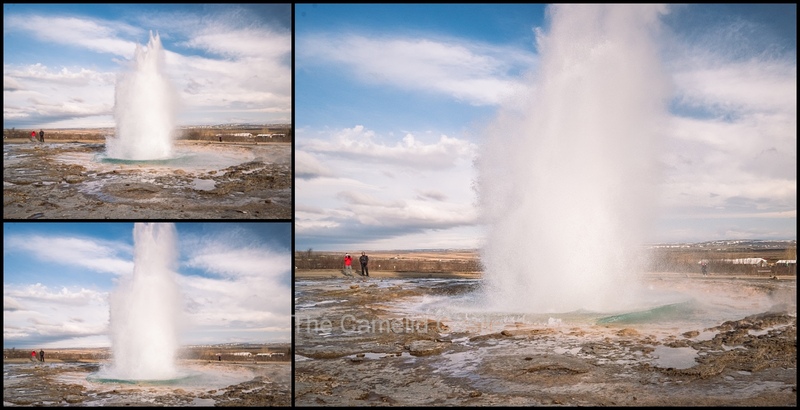 The Great Geysir was legendary for its highly explosive eruptions, blasting enormous jets of scalding water to an impressive heights of between 70 and 90m. 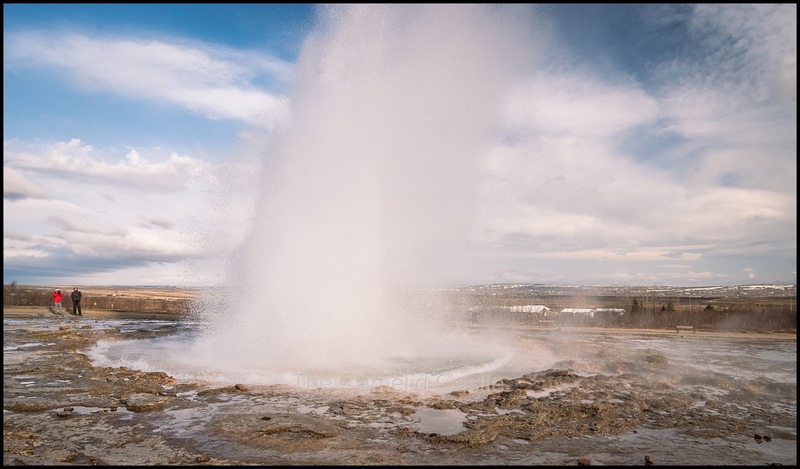 The English word Geyser, actually comes from the Icelandic Geysir! n 1916, the Great Geysir stopped erupting all of a sudden, much to the display of Iceland’s locals and tourists alike. 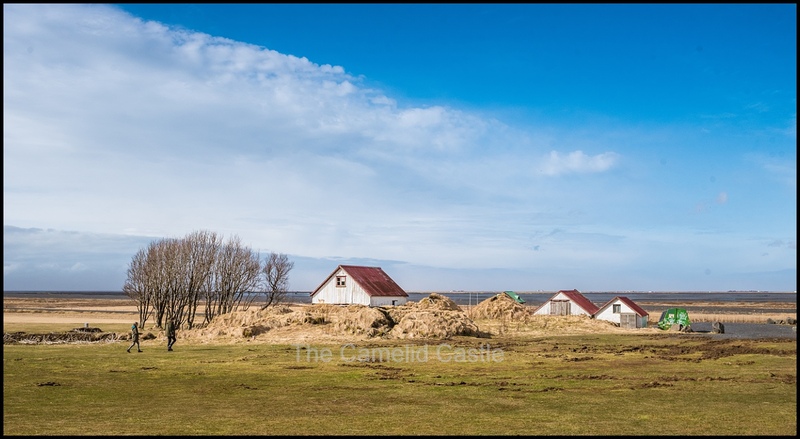 It did briefly surge back into life in 1935, but by 1950, its activity had lessened considerably, and it became fully dormant not too long after. It did erupt a few times between 1981 and 1983 but last erupted in 2000. 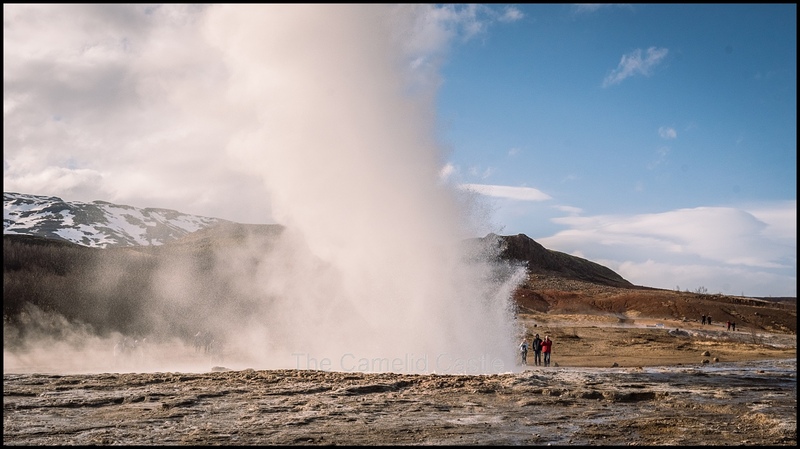 Today, Strokkur, located approximately 100m from the Great Geysir, is a highly active erupting hot spring, that spouts obligingly every 4 to 10 minutes. 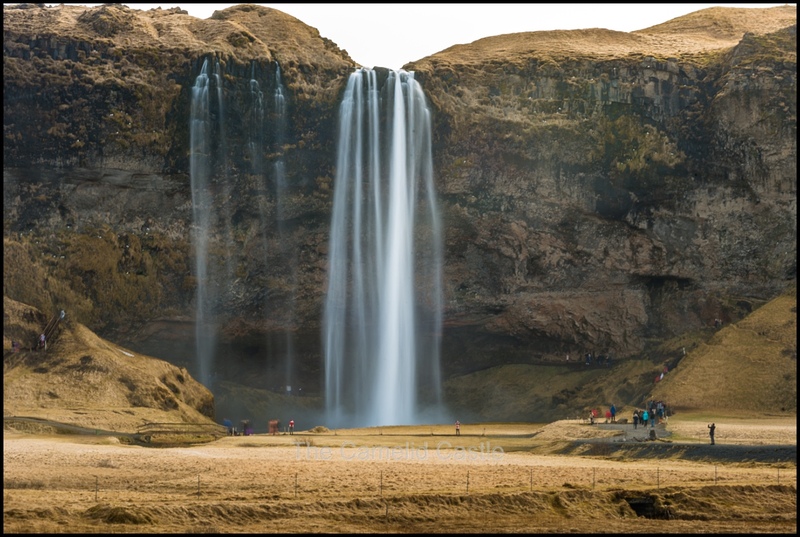 Strokkur means ‘the churn´ and it certainly lives up to its name, churning out great torrents of water far more frequently than any other geyser in Iceland. As we parked and walked into the geothermal area we could see (and smell) more boiling mud and hear the shouts of the crowd as the geyser was erupting intermittently. 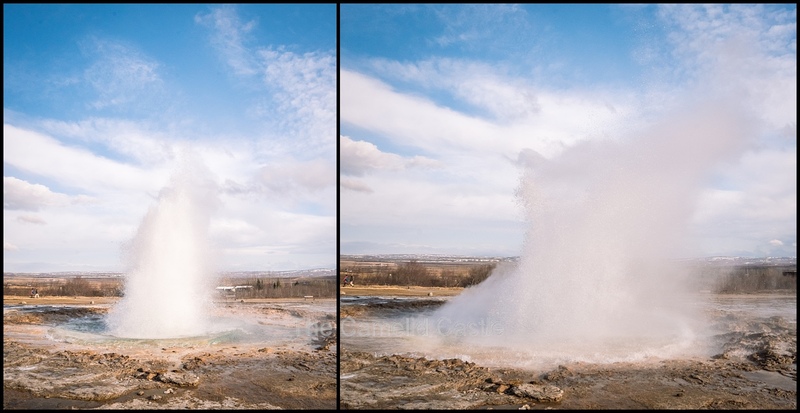 The time span between spouts of Strokkur varies. When you see the surface of the pool boiling a little more vigourously than usual, then swaying a little, this usually means that an eruption is imminent. Finally, the surface of the scalding pool will retract back a little – when this happens a spout of water and steam is usually only seconds away. We got pretty good at telling when it was going to erupt….. The kids loved watching it erupt. The gap between eruptions and the height of the water varied every time, making it still rather tricky to get photos of! We noticed the water-spout wasn’t as high when they gap was closer. While the kids were happy watching the geyser for another hour, they were rather tired so we headed back to the motor home, mostly avoiding the sticky mud and drove to our campsite for the night, a mere 10 minutes away. We arrived just on 6pm and they were actually open! Properly open, not just with power boxes unlocked like many of the camp sites. We were told to park anywhere we liked on the camping field as the snow had melted. Anto went to drive onto the field and then just as he did I saw it was very boggy and shouted out to stop….. but it was too late and we were stuck in thick mud. No amount of reversing or going forward was helping our motor home move. We’d been so excited to make camp at a decent hour and planned a quick dinner and the over-tired kids in bed at a reasonable hour. A bogged motor home was not in the plan. Anto proceeded to try a variety of different things, digging us out, jacking the wheels up, him pushing the motor home while I tried reversing. There was no option of getting anyone to tow us out as there was no hitching point on the motor home. In the end the poor patient but hungry kids were starting to get a bit antsy as they were tired. We gave it a break and cooked some dinner and I supervised eating and tidying up for sleep while Anto individually jacked up each wheel in turn, and put as many rocks under it as he could fit. Once the kids had finished eating and were in their PJs we gave the reversing another go with rocks now under each wheel. After a few tries we got out and quickly got us back to the paved car park area. The whole process took well over 2 hours in the end and did not make for a pleasant end to the day. The bogging did not look that spectacular but their was a lot of mud, thick, icy mud! Poor Anto was frozen and absolutely caked in mud. We were somewhat grateful the camp was open with showers available so I sent him off for a shower while I got kids to bed. It turns out the camp site didn’t have power or running water (or a field you could park on seemingly) but it did have showers and a hot tub which Anto made good use of. It was our last night in the motor home and it was not a great ending. After the kids were asleep we did give aurora hunting one last shot. Alas, despite being in a good location up in the mountains, the aurora activity for the night was low so we didn’t see anything and opted for some sleep before our last day of driving. We’d had a rather adventurous day and were looking forward to making it back to Reykjavik in one piece and the comforts of a hotel! 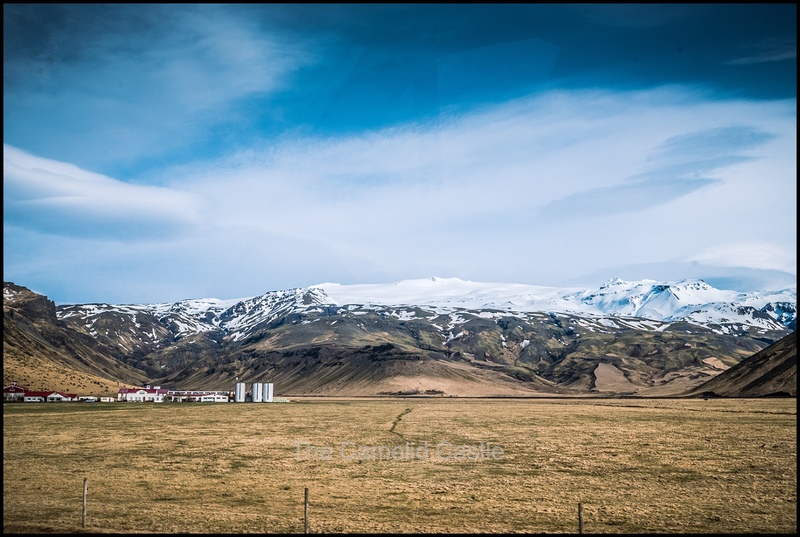 Daily statistics for Friday 13 April 2018, in the South of Iceland – the morning in Vik started out a balmy 6 degrees, but with storms, icy rain and winds around 90km/h. 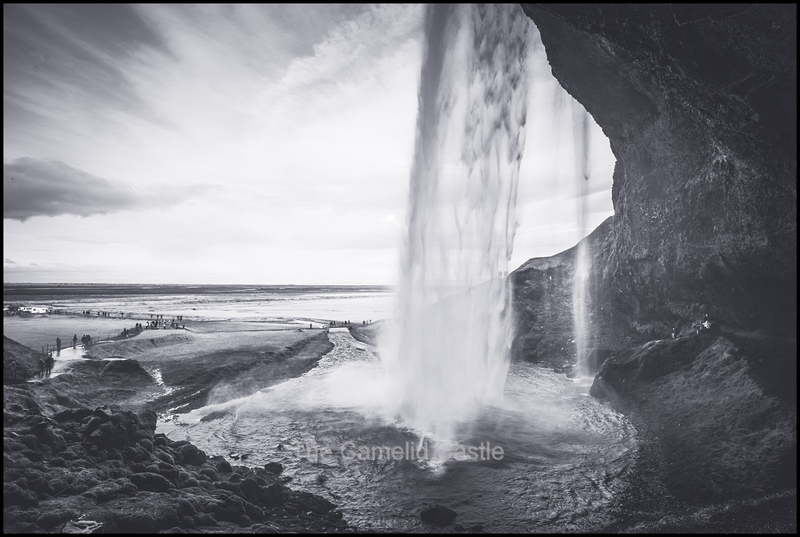 The temperatures at the Skógafoss and Seljalandsfoss waterfalls was between 7 and 8 degrees, but the winds were pretty ferocious. Our swim at the Secret Lagoon in the afternoon had temperatures of 9 degrees (an apparent of 5 degrees, so still not hot) and high winds. 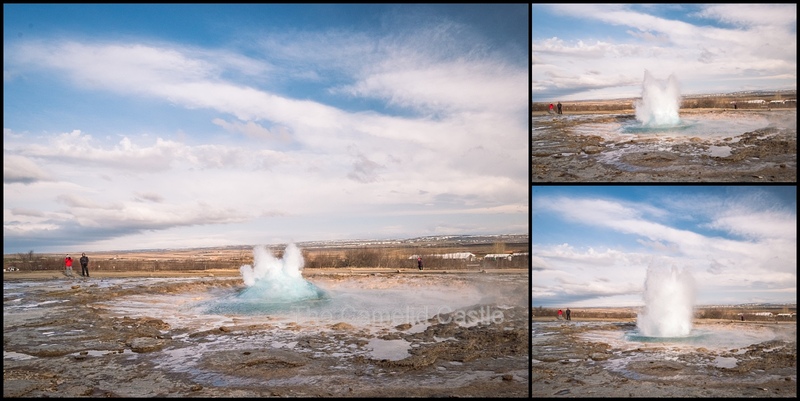 We ended the day in the Geysir area with temperatures of 6 degrees and ‘only’ 30 km/h winds. The total walking for the day was 8.3km, not a huge amount of walking compared to other days. Our total driving for the day ended up being a bit over 200km, or around 3 hours of driving time. Here are our driving adventures for the day, we’d made it most of the way around the country now! Up next, our final day in the motor home……. A crater with blue water, the fissure between 2 the Eurasian and Atlantic plates of the earth and some exploring of Reykjavik in the rain! 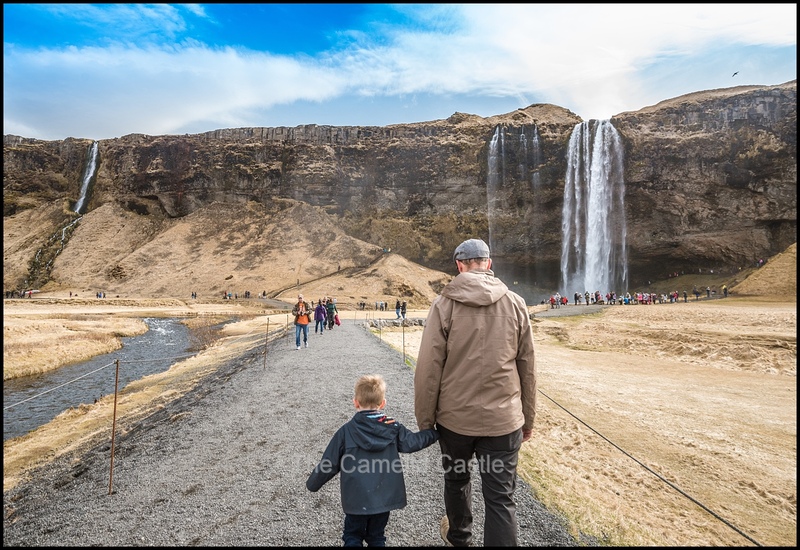 Posted in 4 years, 6 years, Anto, Astrid, Europe, Geyser, Golden Circle, Gulfoss, Iceland, Iceland in a motor home, kids, Secret Lagoon, Seljalandsfoss, Skógafoss, Soren, South Iceland, swimming, Travel, travelling with kids, Vik, waterfallBookmark the permalink.